Ever wonder how to get started in dressage to music? Here’s how I did it and I can’t wait to get out! The night before my Equivisions Dressage to Music clinic I had spent ages getting Katrina clean and shiny. I was so excited about the clinic. I’d already had an email asking me to tell them about which level we were competing at, which movements suited Katrina best and where she was weaker. This was so that they could prepare a floorplan to suit us. The email also asked me to think about what music I liked and thought would suit Katrina. The day came and I wanted to look smart and comfortable so I wore my nice boots and my lovely pair of Tottie Maven knee grip breeches. After a long drive we arrived at Bishop Burton College with time to spare, and made our way to the international arena. It was quite daunting, poor Katrina who barely copes with the judge at C was forced to face five judge’s boxes as the arena was set up for a big para competition the next day. This was going to be fun! First, Steph went through the test that she’d already planned for us, telling me where to go and different ways I could change it in the arena if it all goes wrong. I was completely lost of course, as we all know I can get lost in my own bedroom anyway but it was really interesting to talk through all the tips for avoiding a spook or making it less noticeable in the test by just knowing your music inside out and moving movements up or down the arena. We just hacked through the test first, and this was when Katrina decided to throw some shapes, spooking at judges stands, markers, the gate, it was all a bit hectic really, she does make me laugh! The second time we went through the test we were timed to see how long everything took for how long the music needed to be. 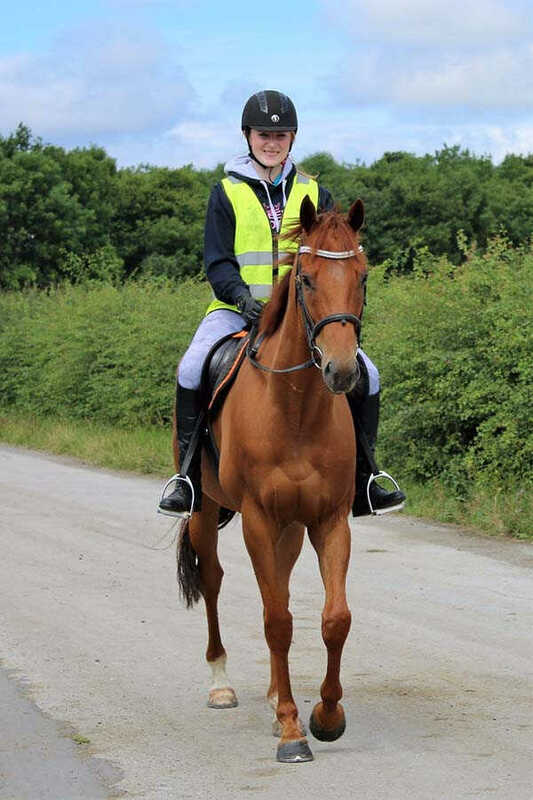 This time Katrina improved massively, and her medium canter felt amazing. We haven't quite got the hang of the counter canter as she kept changing leg but it got to a point where it was simply funny! Finally, it was time to video the test to match the actual movements within the test to the music. It was going really well, I'd done my best to de-spookify Katrina but just as we cantered past the entrance someone walked right into the arena! Of course Katrina didn’t hold with that! However like a trooper she carried on, completely bossing the more difficult parts. The ridden part of the clinic over, we made Katrina comfortable with some hay and Chloe our driver kindly stayed with her while we went to the office which was set up to play the video and choose music to match. I’d already decided that I wanted something fun, I wanted to make people smile and enjoy it with me. Lots of riders use classical, and I was worried pop would go out of fashion, so I chatted about my idea with Julie who really took it on board and added some really fabulous suggestions of her own. The beginning is epic, and it only got better with Julie’s ideas. The ending was awesome too, but that's all I’ll say on that because you'll have to wait and see. I’ll be using my new music at Sheepgate U25 Championships in August I can’t wait to share how it goes with you. I am buzzing with excitement about my music and hope its loads of fun. Sports are so much better if they don't take themselves too seriously all the time!